You can make artworks and concept art for all various things such as space stations, ships (ranging from small fighters and mining machines up to large cruisers and motherships), asteroid bases, portraits of people and faction-related stuff (logos, symbols, flags). Check our forums or ask the community for suggestions! Deadline for the competition submissions is the 1st of April. Send us your artworks and win cool prizes! 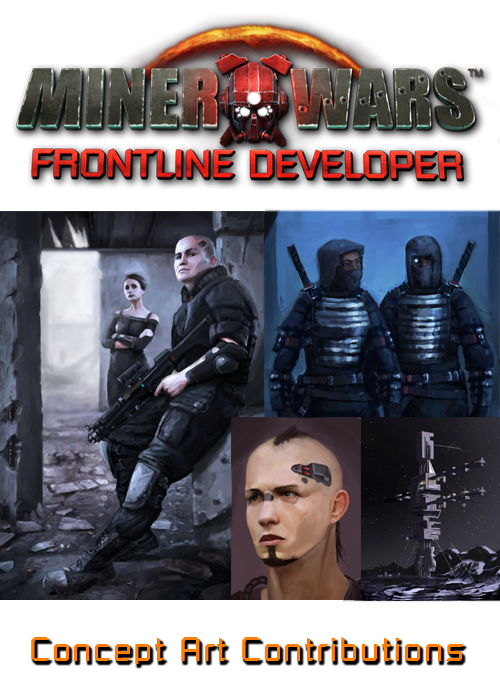 The best artworks will also be considered for print, distributed in the box retail version together with Miner Wars 2081 (as an addition to game manual, etc.). The artwork must strictly adhere to the Miner Wars universe described in MW Encyclopedia. The general mood and atmosphere of the artwork should resemble the setting of Miner Wars 2081. See pictures on our website and in MW Encyclopedia to get a glimpse of the atmosphere and setting. The artwork may be a hand drawing, painting, post-processed render or anything else. The artwork has to be submitted in JPG, PNG or PSD format. The artwork has to be your original work.